In this episode we go way, way back--not just back to an alternate-history version of the American West, but also back to the retrograde masculinity and offensive sophomoric humor of pop culture in...well, in almost any time, sadly. 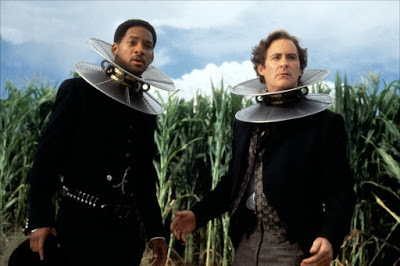 An unholy alliance of ego-stroking and trend-chasing can explain much of Wild Wild West, the film that finally gave Jon Peters the giant spider he always wanted. But is the movie the right kind of dumb juvenile fun? We peel back the layers of Wild Wild West's steampunk aesthetic and latent homoeroticism in a scintillating debate, including a bonus discussion of the music video for Will Smith's iconic contribution to the film's soundtrack. So swallow your pride, don't let your lip react, and enjoy this wild, wild What Were We Watching!